The legendary circuit of Great Britain was host of the final round of the iRacing GT World Championship Series. With a small advantage of only 18 points, our Red car had the chance to win the team’s first world championship title ever. Considering the good chances of winning the crown, preparation was stressful and exhausting but after days and nights of setup work, our teams were well prepared for taking the final challenge of the year. Starting the race in P4, the conditions were not as good as expected but Max Benecke was able to gain a position right at the start in the first corner. From then on it all was a matter of fuel and tire saving. After changing drivers, the Red team found itself in second position. 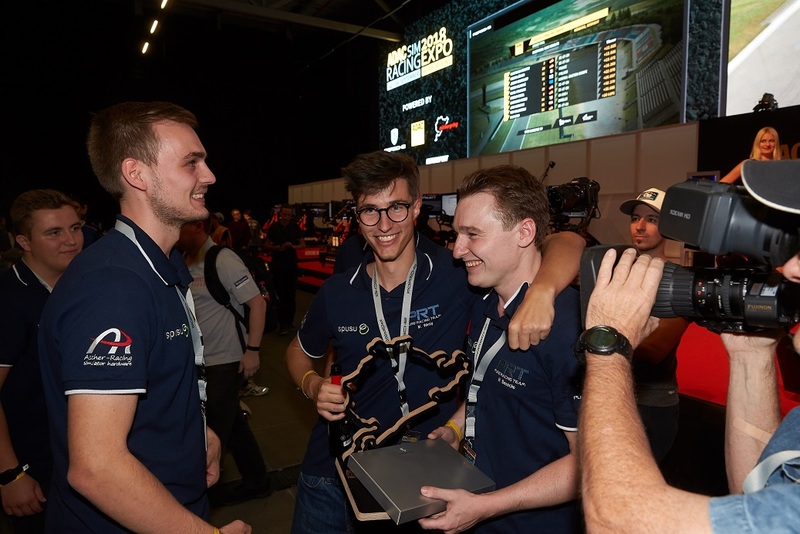 Losing one more spot to the VRS Coanda car, our title contenders managed to hold on to P3 after a tight finish with the TTL car but by G2 Esports winning the race, Max Benecke, Ivo Howeller and Patrick Pichler grabbed the Pure Racing Team’s world title with only 2 points more than the G2 Esports team with Frede Rasmussen, Sebastian Job and Isaac Price. After the two previous tough seasons, this was an achievement nobody could have dreamed off. With three wins and only 1 finish out of the Top 5, our drivers proved to have the consistency that is needed to win such an important and competitive series. Time will show whether we can repeat this amazing triumph in 2019. 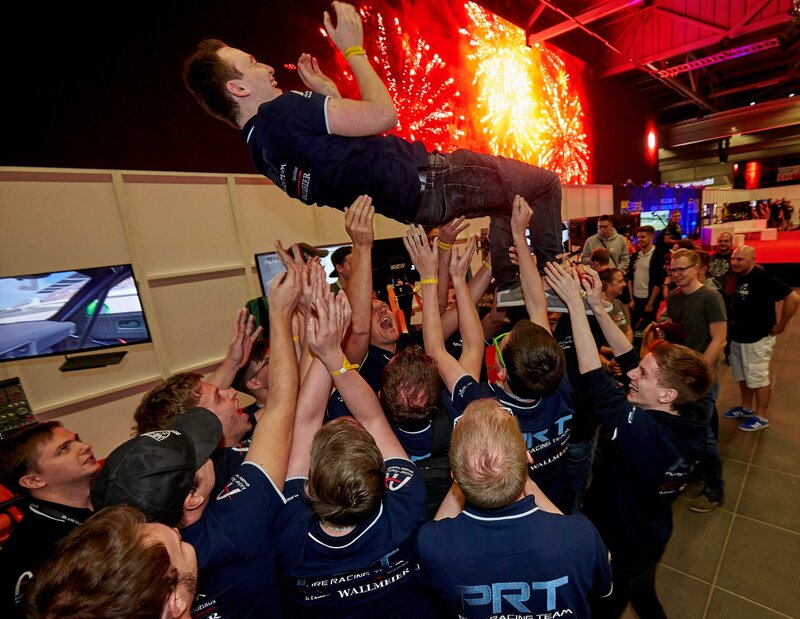 The Simracing Expo probably is the highlight of the year. For a couple of years now, simracers from all across the globe visit the Nürburgring for a weekend full of passion and attitude. Two days of new gear and live competitions give this event the prestige that it has right now. With more than 25 software and hardware manufacturers, there is something for everybody. But it’s not only the new products that make the Expo as attractive as it is right now but also meeting all the people that you normally only know from racing in the sim. Names become faces and that’s mainly what it’s all about. The majority of our team started their weekend on Thursday where our drivers had their own house only a couple of kilometers away from the race track. Currently, the Expo is the only date of the year, where the members get to see each other in real life which is the reason why we usually start our journey two days early. On Friday, Max Benecke, Max Wenig and Marc Elkemann had the opportunity to take a ride along in an awesome AMG GTR around the Nordschleife. Their faces afterward more or less told the whole story without any words. Definitely an experience which they will never forget. 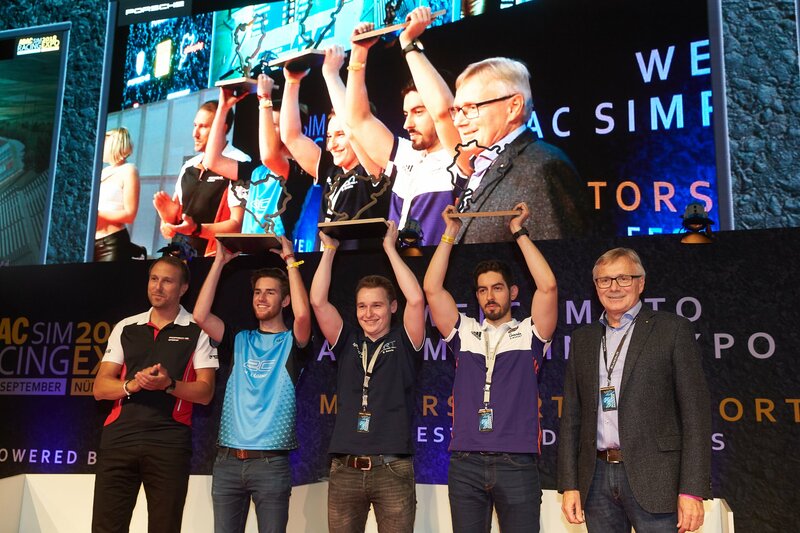 The main event of the Expo took place on Saturday with the Porsche Simracing Trophy. During the summer, people had the chance to get into the Top 40 on the qualifying leaderboard. The special circumstances of the event are the randomly provided simulators by the organizers themselves. Unfortunately, they were not completely equal which added somewhat of a gamble to the already tough competition. With nine of our drivers in the competition, we had a good chance of getting decent results. Five of them managed to get into the semis and in the end, Alex Thiebe and Max Benecke made it into the Final. With a start to finish win of our “Mr. 10k”, we got our first achievement of the weekend and it was huge! The crowd was cheering and our drivers could not hold themselves back from celebrating our hero in style. Overnight, the teams had time to assemble their simulators for the Digital GT500 on Sunday, the traditional endurance event on the virtual Nürburgring. After small problems with the internet connections, all teams were ready to qualify for their starting position in the 32 car grid. 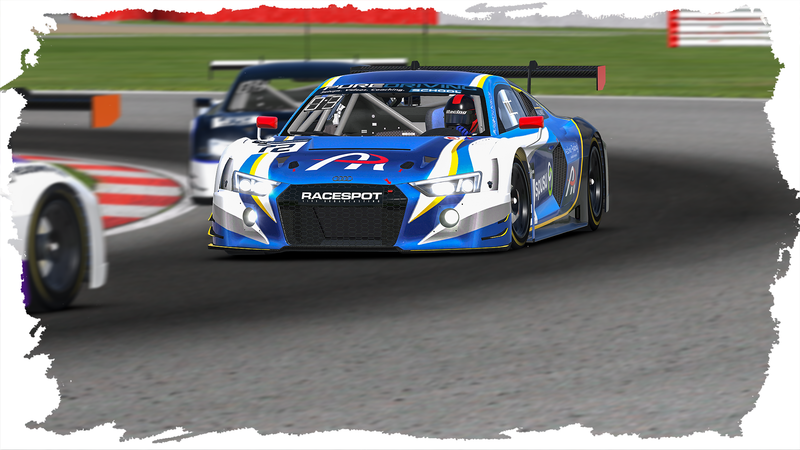 We had three teams, all driving the Audi R8 that they all well know from the GT Championship. Max Benecke and Wenig started from Pole while Gianni Vecchio and Jonas Wallmeier had to start from P5. After roughly three hours of driving and close racing. Team Max finished on the top step of the podium while Jon and Gianni managed to fight all the way up to the third step on the podium. A double podium in one of the toughest races of the year, an achievement combined with Benecke’s win on Saturday that cannot be showcased by any other team so far. With a lot of trophies and smiles in their bags. Our team took their way home, looking back to a weekend that we all probably will never forget. With summer coming to an end and most of the official series being over, our team decided to take a new challenge for the winter. 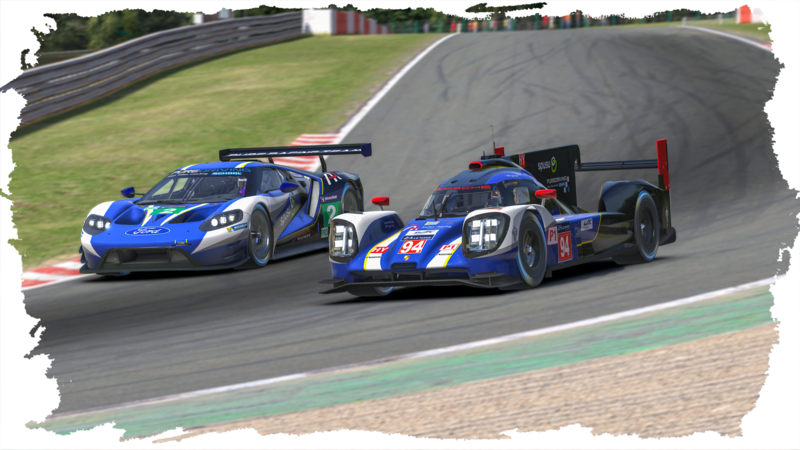 With the Sports Car Open becoming one of the top private series in iRacing over the last year, we have two cars competing in this year’s SCO and therefore making Pure Racing Team’s debut in it. Competing in LMP1, we have Patrick Wolf, Fabrice Cornelis, Marc Elkemann and Denis Grabovsky but traditionally we also have a car in the GT class with Max Wenig, Gianni Vecchio, Jonas Wallmeier und Patrick Heinrich. For its first round of the Season, the SCO maybe already visits the best stop of the calendar. Spa is and will always be one of the most popular tracks in iRacing with it statistically having the biggest competition out of all tracks. Our drivers are not very different. Everybody was hyped for this race and that is why the preparation was rather big for both cars. Starting the race from P2 in the Prototype class and respectively from pole in GT class, we had both cars in the front row at the beginning of the race. With Marcus Hamilton having an accident with traffic in the first hour, Patrick Wolf managed to take the lead but lost it in the same one while going through traffic to the other #3 Mivano car. 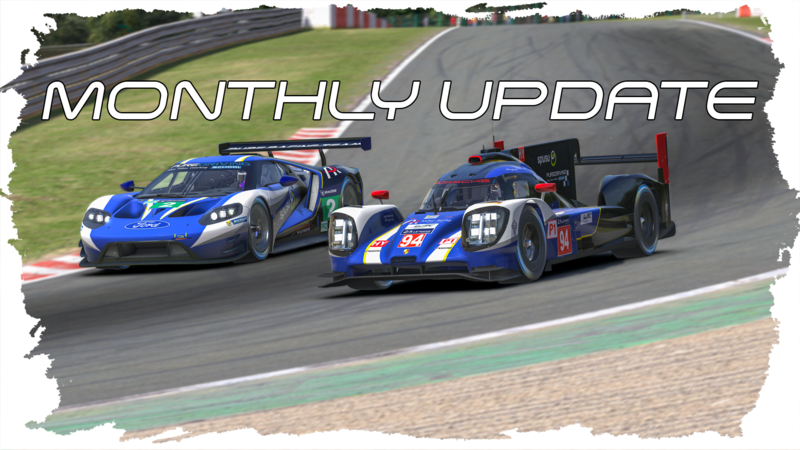 Having an incident with the VRS Coanda LMP1 in the second stint forced them to pit for repairs and induced the fight back to the top. The GT car was able to maintain its lead over the tightly following Williams Esports car but in order to build a gap over them, the drivers decided to put in less fuel for the second which allowed them to gain 3 seconds in the pit and therefore taking away the draft from the Williams car. 3 hours into the race, our prototype piloted by Fabrice crashed in the famous high-speed chicane, called Eau Rouge. With dirty-air of traffic in front and a full fuel tank, the car snapped on him and sent the car into the wall. The following damage was leading to a loss of 9 laps with which our team finished behind the race winner Radicals Online. In the GT class, it was a dominating run from Max Wenig and Gianni Vecchio from start to finish. Minor fuel saving issues in the last stint still did not disturb the two drivers and in the end, they brought their win home with big confidence.